Don't pull at face at the Chlamydia swab. It's a formality they have to put me through. If I did have chlamydia the Clomid might well be pointless because my fallopian tubes could be blocked, and no amount of egg stimulation will work if those eggies can't make their way down my tubes! I'm not worried. In over 12 years together me and my Hubby have been faithful. I was tested for just about everything before we started trying for our first so unless there is something my darling Husband has failed to tell me.... it's going to be clear. What I wasn't expecting was for the nurse to say "Oo, you're over due your smear! I might as well do that while I'm down there!" which was followed by "Ahh, you've had 3 kids. Big were they?" they were all 9lb+ so yeah, pretty big, to which she responded "I'm going to need a bigger speculum!" Nothing like feeling EXTRA self concious while someone grobbles about with your lady parts! Anyway.... 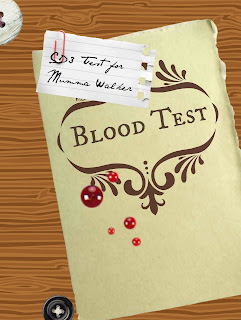 The blood test is the one I am interested in. My doc called it a 2-5 Day Blood Test, although from googling it I see it is commonly known as CD3 because that's an ideal day to test. THIS IS CD3! I'll be going back to see her in two weeks for the results. From what my doc tells me, and from what I've looked up since (so I can digest it a bit better) this blood test will check the levels of hormones needed for me to get an eggie ready for ovulation. Doc said they would be looking at FSH and LH. FSH is Folicle Stimulating Hormone. Fairly self explanatory, it's the hormone that stimulates an egg to mature ready to be released as ovulation. LH is Luteinizing Hormone. I don't know much about what that is, but the levels increase in the lead up to ovulation. I need both of these hormones to ovulate, and they need to be in the right levels too. This test will show up if I have them in my blood, and at what levels. Based on that they can look at possible reasons why I seem to not be ovulating and treat me. Two weeks until I get the results, it's going to feel like a long time!